Given the challenges that Whitley Bay town centre has faced over the last year – with a number of high-profile retail departures – it’s been great to see it at the centre of a good news story today. 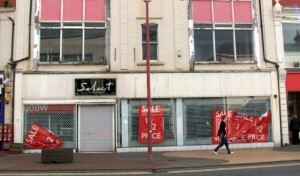 Sources as diverse as The Sun, the Daily Telegraph, Sky News and NewsLite have seized upon the ‘fake shopfront’ that now adorns the former Select store, intended by North Tyneside Council to replace the depressing sight of an empty unit with the impression of a thriving delicatessen. By coincidence, the first property to receive the ‘Shopjacket’ treatment is one that I’d flagged up back in December as particularly ‘horrible-looking’. Consequently, when I had the pleasure a week ago of meeting up with the Tyneside-based team responsible for Shopjacket – among them property consultant Paul Murphy, and creative consultants Neil Wilson and Hayley Rodgers – I was thrilled to see the subject of their first transformation. Instead of being blighted by the depressing appearance of the vacated Select shop, with its grimy fascia and droopy ‘Sale’ posters, Whitley Road now enjoys a much more pleasing scene – an attractive and tasteful frontage that gives an impression of how the unit could once again make a positive contribution to the high street. Who would have thought that a fake deli scene – and a much-needed coat of paint for the drab shutters – could make such a significant visual difference? It’s not the be-all and end-all, of course. 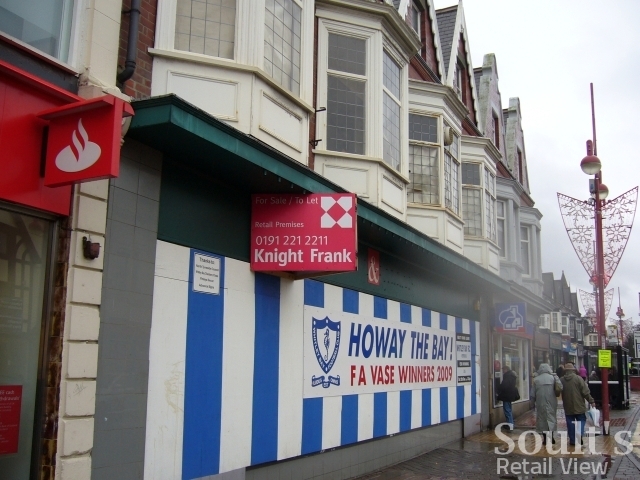 The property’s unattractive upper floors are still in need of work, and behind the fake frontage, there’s still a vacant unit that Whitley Bay could well do without. 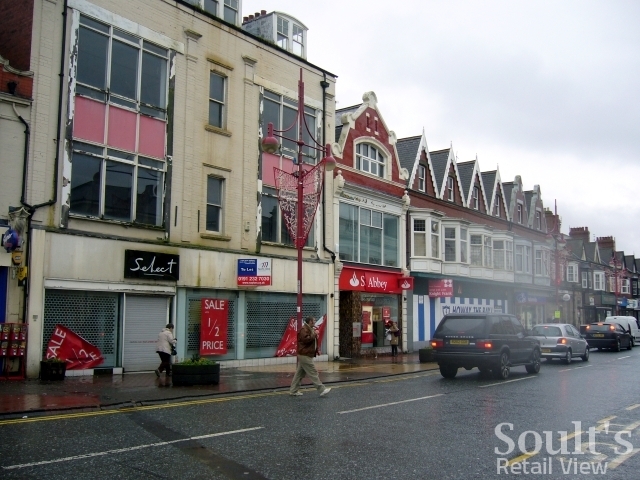 The value of the transformation, however, is that it brings a bit of hope, and some aspiration, back to Whitley Bay town centre – attributes that are essential if high streets like this are to have any hope of bouncing back from recent decline. Crucially, these positive vibes have already extended beyond the former Select shop, with Paul and Neil telling me how some of the nearby retailers in Whitley Bay have drawn inspiration from the fake deli to think about how they could enhance their own shopfronts – often for little more effort than a pot of paint and taking on board some expert design advice. 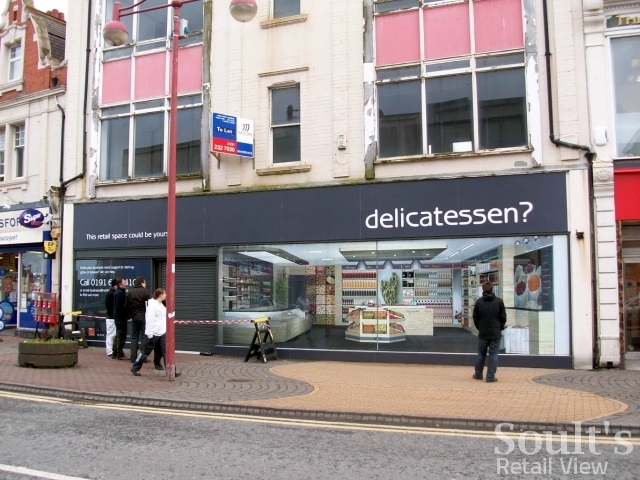 The enhancements to the former Select store are the latest in a string of recent efforts that Whitley Bay has made to tackle the problem of empty shop units, not all of which have worked so well. 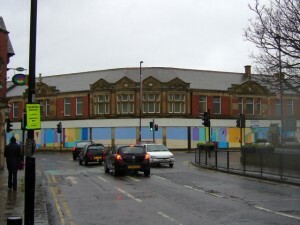 You may recall that in a previous post I expressed some incredulity about the plans to paint the hoardings of the nearby former Co-op supermarket in Whitley Bay, amid the claim from the town’s Chamber of Trade that “an initiative like this can only help attract more visitors and increase trade for businesses in the town”. 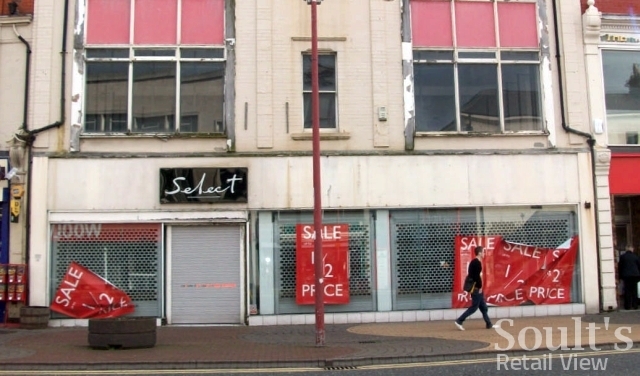 As I remarked then – and still maintain now, having visited the old Co-op for myself back in December – “it’s clearly nonsense to suggest that shoppers will be attracted to visit Whitley Bay because a particular empty shop unit looks more attractive than it did before”. 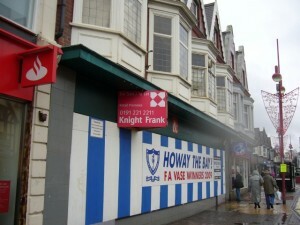 True, no-one would dispute that the painted hoardings do look nicer than the previous grey ones, and the same would apply to the Whitley Bay FC themed paint job of the former T&G Allan shop. 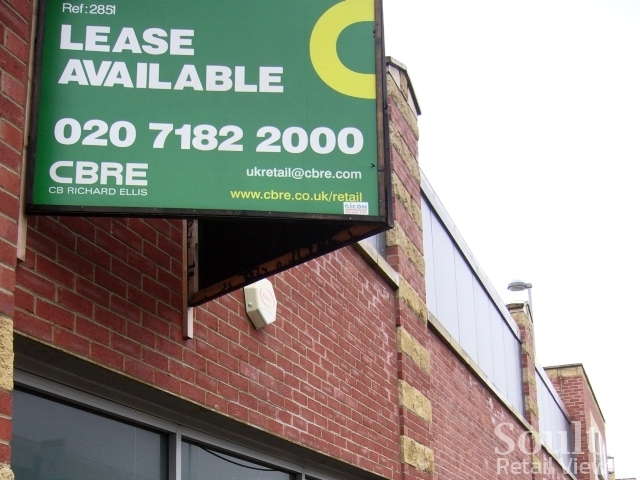 For me though, the danger of such interventions is that they merely emphasise the emptiness of the shops that they are trying to enhance. In this respect, Shopjacket’s approach – creating the illusion that a unit is occupied, rather than merely covering up the fact that it isn’t – is surely more successful. 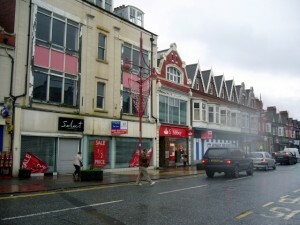 With industry journal Retail Week having recently launched its “Manifesto for the High Street” – a 10-point plan to “breathe life into Britain’s high streets” – Whitley Bay’s efforts to turn the tide of decline are timely indeed. In a couple of weeks, I’m very much looking forward to attending the associated ‘Saving Britain’s High Streets’ summit in Birmingham, where representatives of retailers, trade associations, local authorities and national government are set to come together to address the regeneration of Britain’s high streets and town centres (if any readers of this blog happen to be going along, do track me down and say hi!). After all the negative publicity of its town centre over the last year or so, I’ll certainly take pleasure in flagging up Whitley Bay as one place that, in a small but significant way, is employing some welcome creativity and inventiveness as it strives to turn the corner. 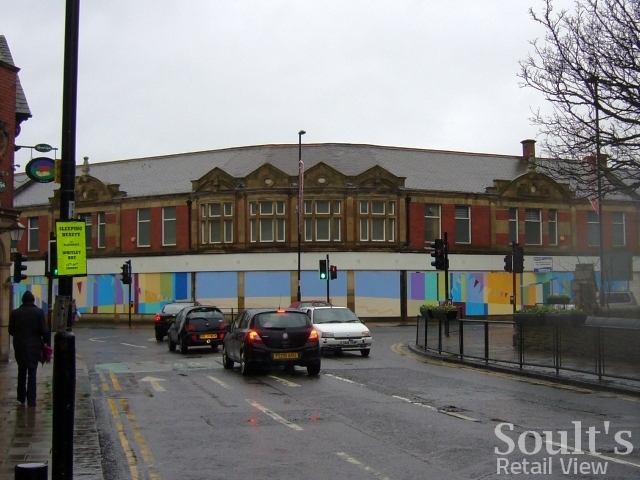 Soult's Retail View» Blog Archive » The Original Factory Shop in Morpeth – a shift towards more upmarket locations?